Hi Keepers, I have what I think is some disturbing news. It appears that my prize hen Manuella has been attacked, I think by a human. Her comb has gone completely, the wound is more like a disection than a fighting wound for example, it is a dead straight line across the base of the comb. Living in an urban area, means we have several neighbours. The chickens have been wandering over to the neighbours properties, one in particular, who feeds the wild birds bread. I believe in some cultures, the comb of a chicken is seen as medicine or such. So beware of letting your chickens wander in urban enviroments, there are many predators in all shapes and sizes. Hi keepers, one of our flock died on Christmas Day, poor Gloria, she had become fly blown for the second time this year, I didn’t spot it as quickly as I did the first time, and sadly it all became too much for her, as we only have a small flock , they all become our pets with names and character, we will miss her dearly. Hi there, I arrived home yestreday afternoon, to hear a strange call coming from one of our birds, definately distressed, I hurried to investigate, to find the dog from across the road, ‘playing with the chickens in our back yard, now this is a border collie/labrador, not a small dog, but young, and so there he was biting the chickens tail feathers to stop her running away, I was not impressed, I ran out shouting at he dog, and grab him by his collar, when I had him under control, Renee a big light Sussex, the one who was being ‘ played with’, actually attacked the dog, amazed she would have a go at something so large, after returning the dog and informing the owner of it’s behavior, I returned to find poor Renee cowering in the corner of the coop in some distress, I checked her over for any wounds, she’s fine other than mentally scarred. Hi there, a few things to note for the changing seasons, we’re going into summer now, or at least well into spring, and a couple of things have come to notice, more flies about already, resulting in one of our hens getting Fly Blown, also they seem to have more lice, so another dusting with lice powder has been administered. Broodiness is also another feature if the changing seasons, and one of our flock Renee has started early, this time were giving her some eggs to hatch. New coop is on the way, hopefully I won’t have to build one for a long while after this one, it will have all the features the girls and we require. Early last evening our lovely neighbour Mani came knocking on the front door, quite frankly I am surprised it has taken this long, over a year now since we got the chickens. I must say the neighbours have been very patient with the hens leaving droppings on their driveway and scratching etc, however yesterday the girls went too far. They ate Mani’s vegatable patch, cleaning out the Silverbeet, and genarally pecked at the other plants, no amount of free eggs will make up for that crime, so the girls have been confined to quarters, back to Camp Tenko they go. I say that but it seems the escape commitee have already hatched a plan, as I found 3 hens on the outside of the run this morning, more work needed on the perimiter fence. It would seem that the hole isn’t big enough for Renee, which is a good thing, because she was singled out by Mani, along with Manuella de Minorca as the main perpetraitors. It is going to be difficult to contain them now that they have had the free run of 3 properties, about an acre of land, or in Daisy’s case the whole block, they’ll be no more wondering around the streets to the locals who feed the wild birds bread. What it means for me is more work, a trip to the garden center for replacement silver beet, and the general sadness at seeing the girls confined to a smaller space. Maybe I can let them out under supervision sometimes, even deathrow prisoners get 30 mins outside each day. Hi there just a quick update, it may seem that spring is here, the daffodils are up , the mallards are having new ducklings, and the girls are laying more eggs. I did notice yesterday when going to collect Betty’s eggs, that there semms to have been a predator around, two eggs had been consumed, so now Betty will have to find a new nesting spot, and then I in turn will have to try and find it. A few dry days have given the garden a chance to dry out a bit, but it’s still a mud slope now. Last year I cut down some 80-100 stands of bamboo, which has been good, as far as it’s given us more garden space, and allows alot more sunlight into the garden, however I wonder how much water those bamboo stands were drinking?, the garden seems alot wetter without them. Hi there, just a quick update, it seems three out of four layers are all quite happy to share the same nest, discovered this morning, also so noticed the fourth layer checking it out too, as her nest looks a bit damp this morning after a nights rain. It would be very convenient if they all lay in the same nest, especially for the chicken sitter. At last Betty our wyandotte has started to lay, we have had her for months, from a chick, and I was staring to wonder when she would lay, well two days ago I found her nest containing three eggs, on the small side to start with. Hi there keepers, it’s that time of year when the nights are getting shorter and the temperature is starting to drop, yes it’s winter down under, we’ve lit the fire twice so far this year, wasn’t really needed, but we felt like a fire. Today I have to admit, that I think I love my chickens too much, I was sorting out their last mix of mash, and I thought it can’t be all that appealing eating cold mash on a cold day, so yep, I mixed it up with some warm water from the kettle, it was steaming a little when i gave it to them, and did they like it, oh yeah, they lappped it up. Reminded me of hot porridge on a winters morning. Hi there keepers, It’s wet today in Auckland, bucketing down, so much so that poor Gloria is complete soaked through, partly due to the fact that she has chosen a nesting spot during the good weather, but now that auturm has arrived, it’s not such a good spot, as there is no cover, she has been laying in the pouring rain. I couldn’t stand by, looking at my favourite hen,( not to mention best layer), doing an impression of a drown rat, so I bought her inside and started to dry her off with an old towel, then it dawned on me that Mrs has a hairdryer, so minutes later, Gloria was getting a blowdry styling, and typically when I had finished drying her, she stood up and started adjusting her feathers, just like when you have left her barbers or hairdressers, and you fix your hair with way you want it, because for some reasons the hairdresser will do what they want to no matter how many times you tell them what you want. News flash, we have 3 new birds, 2 are only a few days old, the other is a few weeks old, lovely group, we now have a Black Minorca, a Light Sussex and a Wyandotte Gold Lace, just got today from a farm not far away in the Waitakere township, what a display of birds this lady had, so many varieties i couldn’t name them all. Show birds aswell, i’m very glad to have different varieties, as it keeps the breeds going. It seems that the more time I spend retrieving them from next doors gardens, the more they roam. Are they like rebelious teenagers? They seem to be, the neighbour to my left, said one of the chickens was in her house, standing in the hallway at the door of the kids bedroom, cheeky, really she should be careful, they do like nice curry next door, fortunately Nellie hasn’t got enough meat to make a sandwich. So yesterday I left them to it, didn’t go and check on them once, until 3pm when I went to get my son from school, they were all there, together,….it’s only a 10 minute round trip, by the time we got back, two were gone. Into Mani’s garden again, Mani and his family are very tollerate of the girls, plus i do give them a few eggs. I found enough pallets yesterday to finish off the deluxe coop, outside the local Placemakers, D.I.Y shop, I found a roll of roofing felt under the bench in my workshop, the previous tennant must of left behind. Infact it’s amazing, now that i have adopted the re-use/ recycle attitude, how many things that I need turn up, they’re not even that hard to find, I think there’s an lesson of life to learn in there somewhere? Well alot been going on, Nancy has layed her first egg, thats 2 months, and it looks a bit rough, very thin shell, with lots of lumpy bits of shell, i imagine it wasn’t the most comfortable egg to lay. The strangest thing about it though was how it came about, Nancy is the bully, top hen, and she has been chasing the other to the point where they will escape to the neighbous for some peace, so i penned nancy in all day to stop this occurring, she had been in there for 4 days,Nancy didn’t seem to like this at all, alot of clucking and noise in general, to which i replied, ‘lay an egg and you can come out’, to my amazement she, who has never layed in my keeping, layed her first egg the very next day, so keeping to my word i had to let her back out into the garden, she didn’t lay another egg for a week. Some may say coincidence, others may say ‘ are you mad?’ ‘ one thing talking to hens, but thinking they understand what you’re saying’ . I’ll let you make up your own minds. Im getting on the chicken band wagon, I,ve been informed that i need to strees the chickens from a farm by keeping them the coop for a day or two, is this right? Hi Peter, well when we got our first 3 hens, we just put them into the run that contained their coop aswell, and left them to it, made sure they had all the creature comforts, feed and water some grass to eat etc, and they were fine, they chose to stay in the coop most of the time, however if you are getting them from a battery farm, where they have been inside their whole lives, then maybe slowly introducing them to the outside would be a good thing. good luck, happy keeping. 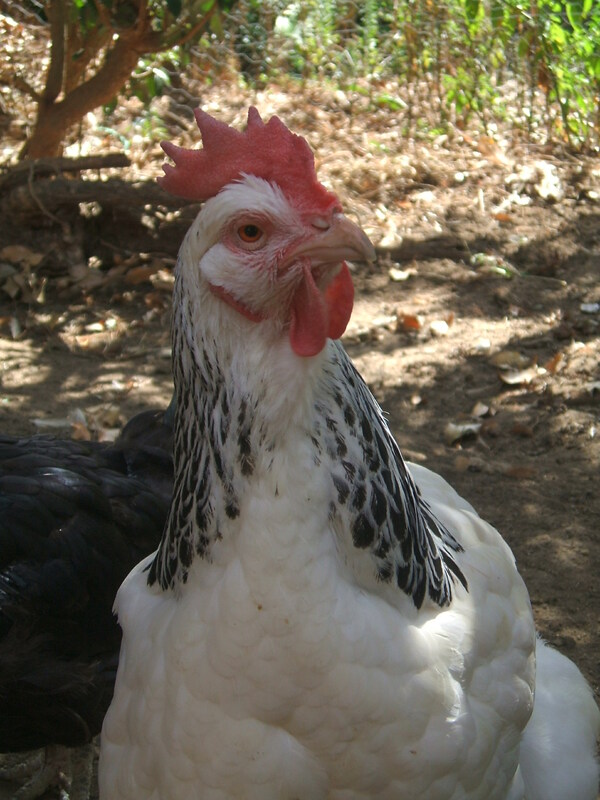 I once had a crazy chook.. called.. Crazy Chook..
She would follow me around like a dog, to the letter box, inside, wait for me to get up in the morning etc etc. A few times we would find eggs on the bed.. (brekky in bed) and another time she sat on the couch between my son and I and went to sleep watching the telly. She kept saying BOOK BOOK prior to this. But didn’t seem to like the books I kept bringing her. She is now living happily at a farm.. I do miss her and the rest of the brood I had, as they were neat to have around (apart from eating all my baby silverbeet). If I happen to get chooks again, and one is particular about what it reads, what would you recommend as good chicken literature? I also speak chicken fluently.. and once had a chicken as a guest on my kids radio show.. despite it thinking it was a pirates parrot and would only answer to the name Polly. Anyhoo… thank you once again. Great website!, I’d like to pass along some helpfull info I found on healthy homemade dog food recipes that I think you guys would find interesting. Most retail dog food is not good for your dog, There are health homemade alternatives for you. Hi. I am about to start keeping my first chooks since about 1970?? Can the shells of the eggs that we have eaten be re-cycled into the chooks food?? or do we need oyster or other grit??? I’m fairly new to the chook keeping game too but was told by an ‘old timer’ that you can wash the shells, let them dry and then crush them before feeding them back to the chooks. Important point – make sure you crush them quite well so they don’t look anything like an egg or else your chooks might start eating the ones they lay. It seems it’s a great source of calcium for them. I sometimes mix it in with their mash or just put the crushed shells in a bowl and it’ll be ‘gone in 60 seconds’. BTW, the old lady also told me a handful of meat a day is good for them too. Eggs are all protein and calcium so if you provide it in their food, they won’t leach it from their own bodies. Old wives tale/myth? I don’t know but my chooks love it! I use pet mince. Hi you all. Thanks for the confirmation re feeding chooks dried & crushed egg shells. For those who have trouble keeping your chooks home, I am purchasing a ROTOCHOOK (Pat Pending) house & run combined. Ideal. Keeps the chooks in & they dig the garden for you so that you can plant veges & get them before the chooks do. I will keep you posted on the progress.